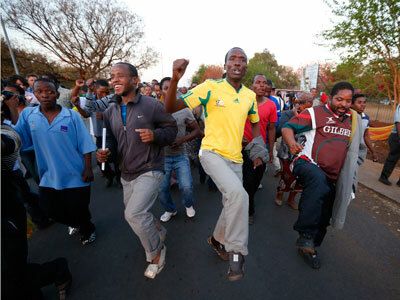 The first of 270 miners arrived home jubilant amid cheers from their families and friends. The men were accused of murdering their colleagues during a protest, despite all evidence showing the kill shots were fired by police. Women cried as they were reunited with their husbands, relieved to have them home again. Some, like miner Victor Molefane, got an even bigger “welcome home” present – as Victor walked out of jail, a free man, his wife gave birth to their son. “I am very happy,” the new father told South Africa’s Mail and Guardian daily, as he wiped tears of joy from his face. 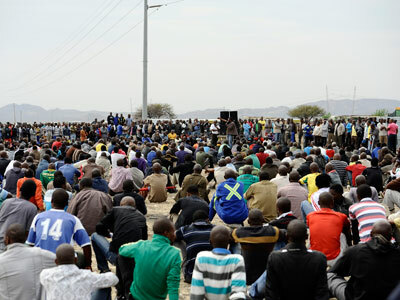 Supporters of the detained men gathered outside the Marikana platinum mine to celebrate their release, and soon all those gathered were dancing and singing. State prosecutor Nigel Carpenter confirmed the murder and attempted murder charges against all 270 miners arrested were dropped. But the miners’ lawyer said he will file a motion to drop all other charges against his clients as well. "All the charges are incompetent and should be withdrawn," Dali Mpofu said. He told reporters this issue will be addressed when the trial resumes in February next year. 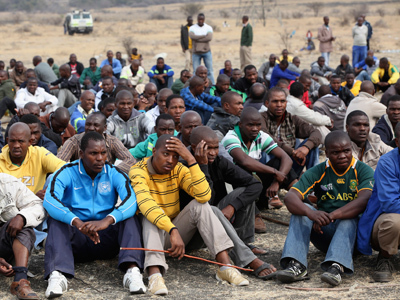 The Lonmin platinum mine in Marikana, in the country's North West province, made headlines on August 16 when protesters clashed with police while demanding their wages be raised to over $1,000 a month. The crackdown claimed the lives of 36 people – 34 miners and two policemen – and left 78 injured. Police originally claimed they fired their weapons in self-defense, as the angry mob was getting aggressive. 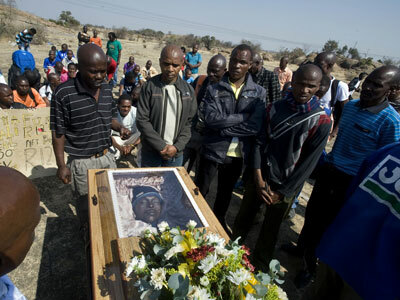 But leaked findings of victims' autopsies, published by the South African Star newspaper, showed that the miners were shot in the back while running away. An official spokesman refused to confirm or deny the accusations on what is already being dubbed the Marikana Massacre – the most violent episode in South Africa’s history since the 1994 end of apartheid.